Click Here to Contact Us For a Free Consultation For Your Wedding Cake or For Any Event Needs. Have you ever had a slice of your favorite cake and it made you close your eyes and think about something heavenly, it was so good? How it just melted in your mouth and left your taste buds begging for more? That's the kind of cake we love to create here at Tomorrow's Caterers Inc! Our cakes are famous across the Washington DC, Maryland, and Virginia tri-state area! For any occasion, such as weddings and other special events, we are ready to design the cake of your dreams! Read below to learn more about our pricing and more! Prices included: hexagon, squares, hearts and more. *Fillings are included: lemon, strawberry, cherry, apple, raspberry and more. *30 delicious flavors are included: rum, lemon, butter, pound, chocolate, almond and more. 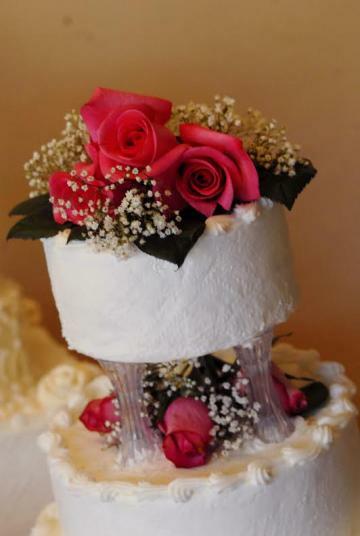 Extra: novelty cake, ornaments, silk leaves, pearls, lace flowers, bows and Ribbons.